Not too long ago an eight pointer was an eight pointer and a 12-pointer was a sight to behold. Deer hunting has evolved. Now when you show someone a picture of your 12 pointer, they immediately ask, “what did it score?” Turkey hunting is also evolving into a scored hunt. If you prefer to call a nice turkey “a nice turkey”, check out another page on foremosthunting.com. If you’re interested in knowing how your turkey stacks up to the best, get yourself a measuring tape and read on. There are three variables in scoring a wild turkey. Weight, beard length, and spur length. The easiest measurement is weight. Weigh the bird and covert the ounces to decimals. For example, 23 pounds 4 ounces is 23.25. The second measurement is beard length. Measurements should be taken to the 16th of an inch. To score the turkey measure from the turkey’s skin to the tip of the longest whisker. Once you have that measurement, multiply the number by two. 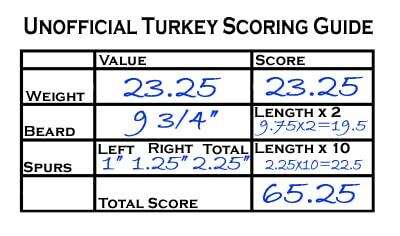 For example, if the turkey has a 9 ¾” beard, the score would be 9.75 x 2 or 19.5. In deer hunting there are typical and non-typical trophies. The same can be said for turkey hunting. Turkeys with one beard are known as typical. Multiple bearded turkeys are known as atypical. For atypical turkeys, simply add the lengths of each beard and multiply the total by two to get the beard score. The final factor is spur length. Measure the spurs from the base to the tip on both legs. To get the spur score, multiply the total by ten. For example, if one spur is an inch and the other is 1 ¼”, the spur score is 2.25 x 10 or 22.5. To determine the final score, add all three numbers together. Our example bird has a weight of 23.25, a beard total of 19.5, and a spur total of 22.5. That scores this gobbler at 65.25. In my book, that is a dandy bird that anyone would be proud of. Here’s where this math can ruin the fun. Our gorgeous example bird is a long way from the record eastern wild turkey. This Kentucky bird scored 104.81 with over 2” spurs, 13 ¾” beard, and a weight of over 33 ½ pounds. If you hunt in Missouri, the state record was scored at 94. Suddenly, your dandy bird doesn’t look so dandy. Scoring a turkey is a double edged sword. On one side, turkey hunters now have a way to quantify their trophies and compare them with others. The drawback is scoring can make what was otherwise a great experience a disappointment because the numbers didn’t add up to expectations. Personally, I like to score turkeys but I compare the numbers to my own turkey trophies. After all, they any legal turkey is a good one. 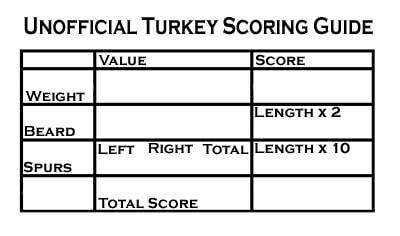 Feel free to print out this scoring guide to help measure your next gobbler.